The multi-part sculpture is called 'Dr Salter's Daydream' and shows the whole Salter family. The scene is poignant in that Joyce died at the age of eight. Sadly the statue of the doctor was stolen in 2011 (presumably to be sold for scrap) and following this, the statues of Joyce and the cat were removed for safekeeping. 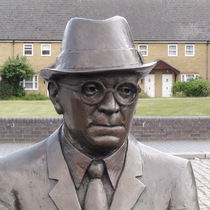 A campaign was set up after the theft to raise funds for a new statue. At the same time, Diane Gorvin, the sculptor of the original statue, drew up plans for the replacement group, which would also include a statue of Salter's wife Ada. In the group, ‘Dr Salter’s Daydream’ Alfred, in his old age sits imagining Ada, Joyce and her cat as they once were in happier days long gone by. View from the Mirror has followed this story closely and happily reports that the entire group was reinstalled and unveiled on 30 November 2014 with the addition of a statue of Ada. June 2018: We have updated all our photos. A small plaque on the wall near the Joyce statue: "Doctor Salter's Daydream by Diane Gorvin, 1991, for London Docklands". There have been two information boards at the site, the original and the replacement. We have transcribed both and put the text on Alfred's page. Sculptor. Trained at the Bournemouth and Poole College of Art.